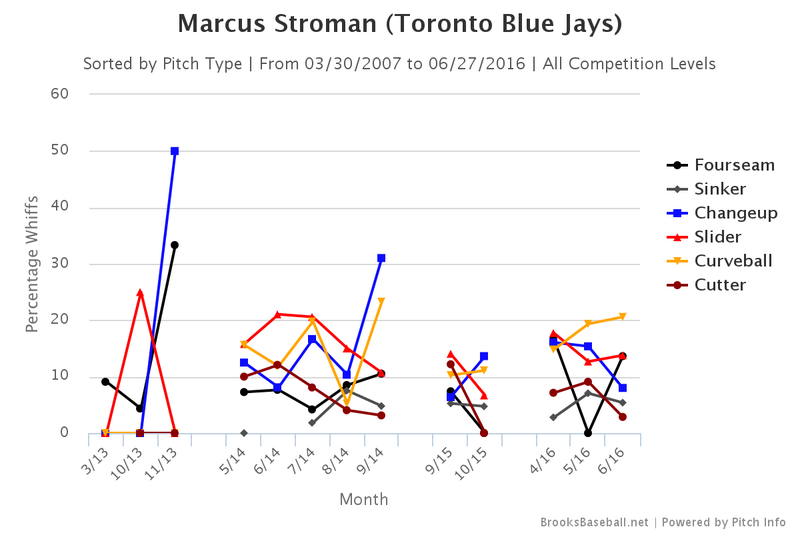 Jays in the House: Where did Marcus Stroman Go Wrong? 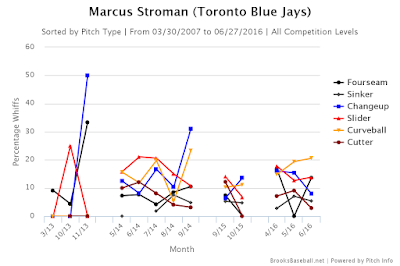 Where did Marcus Stroman Go Wrong? Let's rewind to the start of the Blue Jays 2016 Training Camp. With Alex Anthopolous, the architect to the clubs first playoff team in 20 years, suddenly departing from the front office, the new management group of Mark Shapiro and Ross Atkins had some serious PR work to do. It's rare to find a team coming off a winning season with such turmoil in the front office. The teams hired ace, David Price, has left to join a heated division rivals. The middle of the order sluggers, who this team has been built around, are entering contract years and looking to get paid. 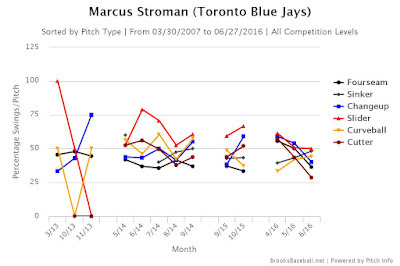 The rotation was constructed (likely by the team of Tony LaCava and Andrew Tinnish) with another year of R.A. Dickey, knuckleballing his way through the AL East, and two familiar faces- a change-up specialist in Marco Estrada and a re-invention project from pitching guru Ray Searage, J.A. Happ. There was a battle for the 5th spot, luckily won by Aaron Sanchez, and one man who looked ready to put the weight of the rotation on his shoulders and run with it like he was rehabbing twice a day at Duke University. 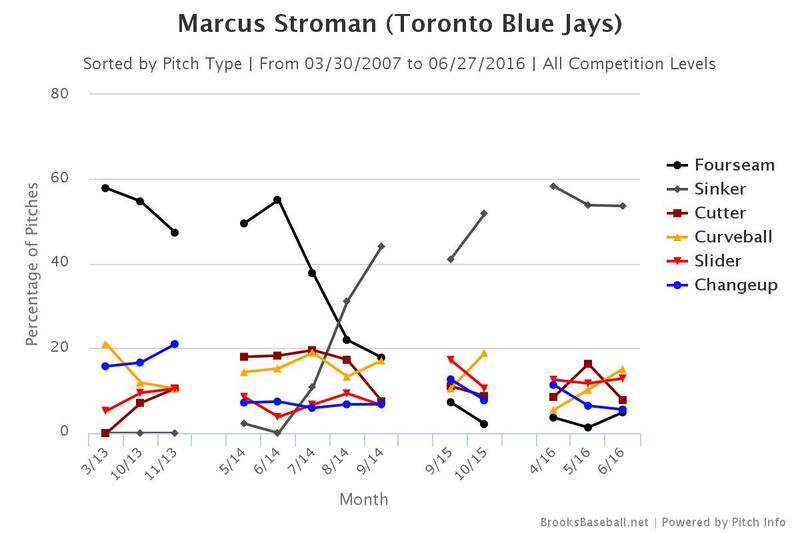 That man was Marcus Stroman. With his flashy persona, catchy hashtags, and motivational quotes, the city was starting to fall in love with it's potential Ace of the future. Comeback story for the ages aside, he was nothing short of great down the stretch in 2015. He finished the regular season 4-0 in 4 starts, averaging 6 strikeouts per 9, with an ERA of 1.67. He outperformed his xFIP slightly, but even at 3.34, it wouldn't necessarily be any cause for alarm. He started the all important, do or die, game 5 we all remember against Texas, even if he didn't factor in the decision. 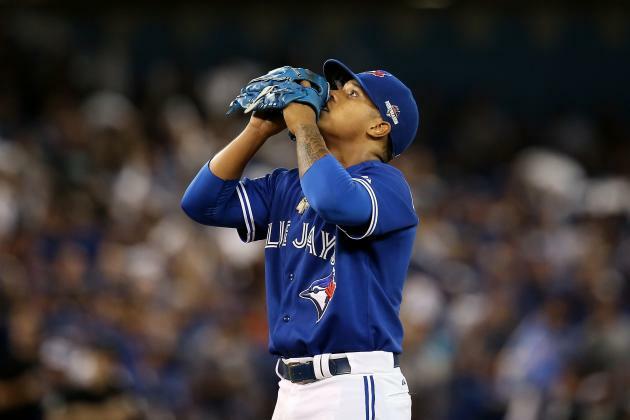 He finished the playoffs with a 1-0 record and a 4.19 ERA, and by all means pitched well, and gave the Jays a chance to win. So what is going on with him over his last 8 starts? What has he been doing differently? "To me Stro’s got to be careful because he’s almost a little bit bored being good, if that makes sense. I mean, to work on the quick pitch and stuff? I mean, with 27 career starts, the league already knows what you got -- I get that. But don’t adjust until the league makes you adjust. I remember a story in Fenway when Cecil -- I had Cecil in the bullpen. He said, I think it’s time for me to make an adjustment, I said, “Cec, you’ve got a two ERA. You had one bad game. We’re going to change everything?? ?” So I think players sometimes try to make too many adjustments at times. But Stroman’s got two things that are huge: confidence, and he can spin the ball, and he’s a competitor, and it’s just a really good combination." For some reason that quote always stuck with me. The quote is talking about the quick pitch (which I think has been scrapped??) but I feel like it could have something to do with his struggles at this point, the quick pitch, the switch to a ground ball pitcher, as if he's trying to take something that works from others and utilize it himself. I admire him attempting to adjust, and be 'the guy', but sometimes what works for someone else doesn't work for you. I think it's important to stick to what he has been successful with up until this point in his career. 2015 is a pretty small sample size. He only started 4 games in September and 3 in the playoffs. So if we look at his rookie year, in 2014, he was actually better than he was in 2015. Crazy, huh? He had a 7.65 K/9 rate, with a 1.93 BB/9 rate, which is better than both of his last two years. In every level in minor league ball he was in he posted double digit K/9 rates. There is a reason he was moved through the system so quickly, as he was legitimately proving himself at every level until he reached the bigs in 2014, where he posted an 11-6 record with a 2.84 FIP, managing to accumulate a full 3 wins above replacement in only 20 starts (130 IP). Extrapolate that data over a full season and you're approaching legit all star territory. I'm going to compare this year with 2014, as 2015 is tough to gauge as it was such a small sample. Looking at his pitch usage data provided by FanGraphs, tells you that he's using his curveball and cutter a little bit less, and his fastball and slider a little bit more. 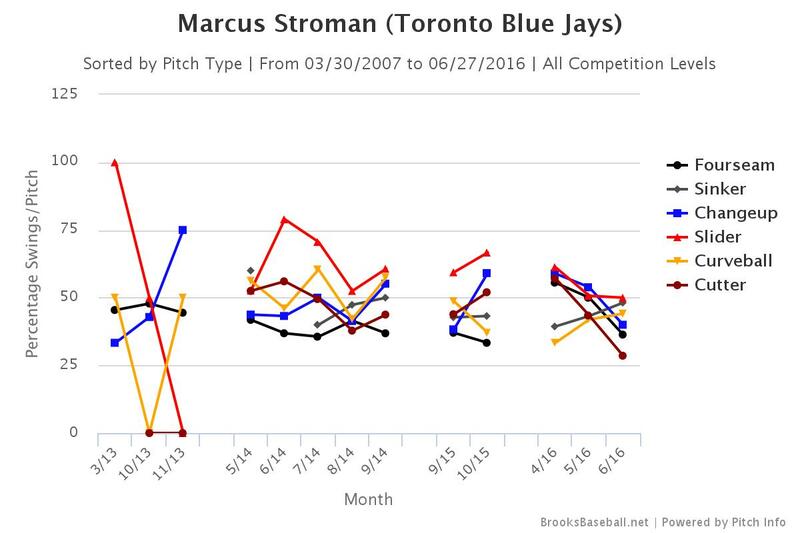 Overall not a huge difference in pitch selection, so lets head to Brooks Baseball to see what I can uncover. The guys at FanGraphs would probably have no problem discovering what the problem is, but I've sorted through to see if I can notice anything that has significantly changed from when he was successful up to when he was not. Hm. The curveball is the pitch he gets the most swing and misses, yet it's the pitch he uses the least (right next to the change-up). 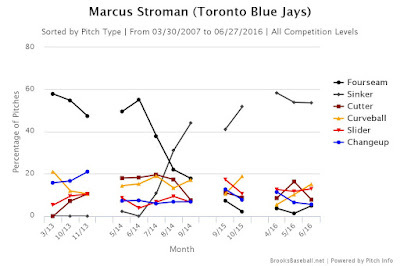 His four-seamer and his sinker are getting hit the hardest, yet he is throwing them the most. That doesn't seem to make sense to me. One of my theories before I looked at these charts was that hitters are picking up the ball out of his hand better than they have in the past. I think this has something to do with the fact that his sinker and four-seamer have similar movement and speeds, so hitters can adjust to location quickly because they are able to time their swing the same and let their eyes adjust their hands once they pick up which pitch is coming. In order to change that problem, I would suggest throwing more change-ups and curveballs, using the fastball to get ahead of counts, and throw less of this sinker until he can figure out how to make it sink a little bit better. Pete Walker and Stroman have been working on his mechanics to help him 'hide' the ball a little better when it comes out of his hand. Keeping his hands back and his body turned that extra second can make a huge difference (it's one of the things Kuechel has had issues with this year, who has similar ground ball profiles and has had his share of struggles). I was lucky enough to catch them throwing on their last off-day before the road-trip and I think they have been working on hiding the ball a little better. Keeping the hands down as long as possible can help him to that. A lot of people are saying send him to Buffalo - I'm not sure that we are at that point yet. Maybe if things don't improve by the all-star break we can explore that route. If he can hide the ball a little better, locate the fastball (a key for every pitcher) and mix in the change-up and curveball more and throw his sinker less, he will have more success. Believe it or not, he's already accumulated 1.4 WAR over 16 starts, which isn't quite what he did in his rookie year, but still belongs in a major league rotation. He ranks 10th in WAR for pitchers under the age of 25, and he has the lowest K/9 of anyone in the top 10. The only pitchers under 25 who strikeout less batters than him are Martin Perez and Matt Wisler. So if he goes back to missing bats and striking people out, he will have more success. Stop trying to focus on getting deeper in games, and let the bullpen worry about the late innings of games. But the state of the bullpen is a topic for another post.